Nature has given us multiple resources which, wisely used, can help us to deal with most of our ailments. But how is it possible to combine long-time therapeutic treatments with the latest technology. Shoppers who are looking for natural alternatives to deal with their respiratory conditions are well aware of the benefits provided by both, steam and aromatherapy. Finding such device, one that offers the advantages of using essential oils and is an effective humidifier as well, may sound to be utopian. Fortunately however, several manufacturers have taken heed of users’ needs and have come up with novel devices that possess a dual function. In recent years, there has been a rising market for all types of scenting devices. Even when they appear to be practical and efficient, the risk of resorting to most of these means is that they are often full of chemically-laden substances that do little to contribute to one’s respiratory health. Such is the case with plug-in air fresheners; while they may smell nice, they provide no calming or therapeutic effects whatsoever. Moreover, they have been found to possess harmful effects not only on our respiratory, but also on our nervous system as well. 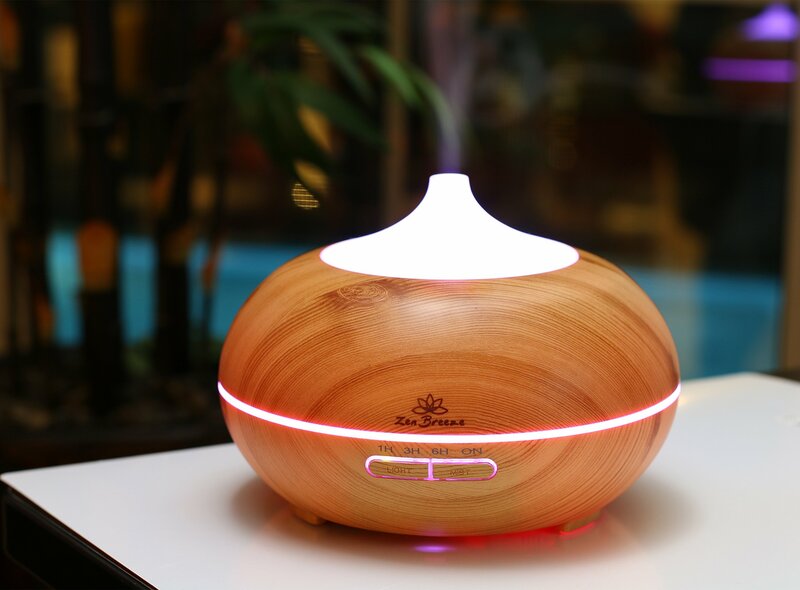 The ZenBreeze Wood Grain model on the other hand, provides fresh, clean and naturally-scented air that can be helpful to create either a special atmosphere or alleviate certain respiratory issues, depending on the type of essential oil that is being used. Because this diffuser model uses vibrating sound waves technology to create an ultrafine aromatherapy mist, it distributes both the mist and the scent much more efficiently than most other methods, such as candles, sprays or plug-in devices. Finally, the device features an adjustable quiet ultrasonic coolmist operation mode which is vital since essential oils lose their properties when heated. Another reason that makes this ZenBreeze unit a favorite with many health-conscious households is its simple maintenance. Whereas many humidifiers and diffusers require continuous refill or costly filter replacements, this product is simple to set up and highly sustainable when it comes to using it. For one thing, this unit works continuously for ten hours only with one single fill. In addition, thanks to an automatic shut off feature, the diffuser turns off by itself when the container runs out of water, thus preventing any possible damage to the unit or any of its components. A for cleaning and maintenance, the unit is simple to disassemble and clean. Unlike other similar models, the ZenBreeze diffuser does not form any mold. All it takes is a hassle-free cleaning routine once or twice a week. 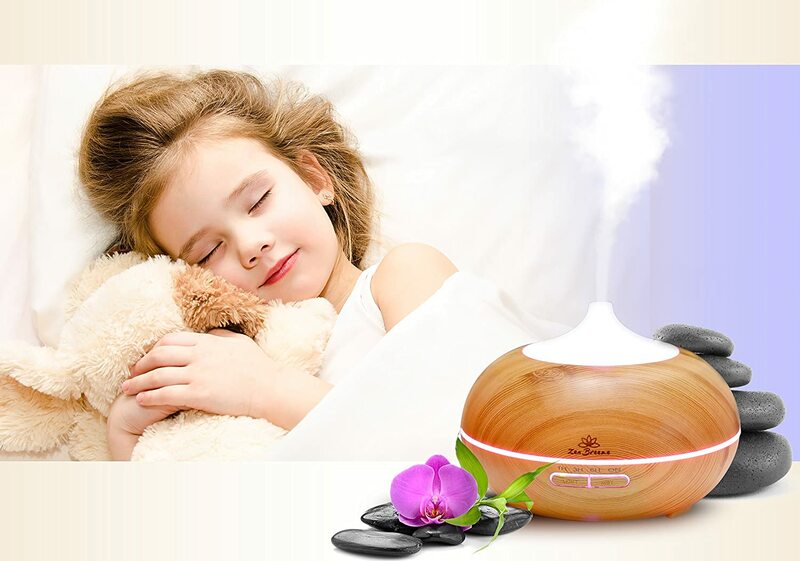 Despite being a new product launched only this year, the ZenBreeze Diffuser Model Aroma Humidifier has gotten more reviews than most other products. Since most comments are positive, let’s look at the most relevant aspects that are contributing to making this unit a favorite among users. First off, a large percentage stated that they had turned to this gadget because of medical or health reasons and that they had witnessed a significant improvement in their symptoms, especially those linked to sinus infections, dry skin rashes or chronic coughing. In addition, most reviewers agree that the unit’s diffusing features are noteworthy when it comes to assessing their significant contribution to health. Similarly, many reviewers have described this unit as being simple to operate and clean. Another popular comment concerns the diffuser’s beauty. Not only is the wood finish attractive, but also long-lasting. Because of its classic, yet cozy lines, the ZenBreeze makes a fine choice to decorate, scent and humidify family rooms, spas, gyms or offices following any type of decor. Despite being one of the best ranked products, this diffuser has not been able to satisfy a small percentage of users who claim that the scent does not reach all the expected area or that the aroma would soon fade in larger rooms. Even when this may be true, potential users should keep in mind that aromatherapy is not something to be achieved efficiently in large surfaces. However optimal, the ZenBreeze diffuser will work on a limited surface only, so check the size of your room before purchasing the unit. Or else, some reviewers have found it useful to get several units for different rooms in their homes. This way, maximum diffusion can be achieved most optimally. In short, this is a product to keep an eye on, especially for those health-conscious shoppers who are looking for an elegant diffuser that will contribute to alleviating some health issues. Read more: Best Humidifier For Your Baby: Which Option Best Fits Your Family?